For many craft artists, natural materials are essential to their work. In this section of Education Guide: Landscape, students will learn, through the work of George Nakashima and Jan Yager, how raw materials are transformed by artists into works of art that reflect upon and respond to their relationships to nature. Students will also explore how the artists’ deep connections with their natural surroundings inspire them to create beautiful, functional objects. Not everyone can live in the woods, but people can live with wood and stay connected with nature. Trees. Mountains. Rivers. Whether we live in the country, the suburbs, or city we are all connected to and part of the natural world. For some of us, all we have to do is walk out our front door to see beautiful vistas, while for others, nature is found in a small blade of grass growing through a crack in the sidewalk. Regardless of where we live, we all have some connection to nature and the landscape that surrounds us. Our connection to the natural world is complex. Some people are deeply appreciative of the bounties nature affords us, while other take it for granted. However, most people understand the role nature plays in our lives, are concerned about the state of the environment, appreciate nature’s beauty, and incorporate nature, in some way, into their daily lives. We decorate our homes with nature-inspired motifs and images, plant gardens, bring plants into our homes, and play in parks. No matter who we are or where we live, we all have at least some connection to the natural world. For many people, including craft artists, nature is also a source of endless inspiration. Colors, shapes, patterns, and textures are ever-present in the flora and fauna that surround us. We also look to nature for materials to make a wide range of products–trees for paper and furniture, cotton for clothing, clay for dishware, gems for jewelry, etc. Nature’s capacity to inspire is endless, and our connection to it is deep, rich and boundless. People need water, food, and air to live; the late master woodworker George Nakashima also needed wood. Growing up in the forests of the Olympic Peninsula, he developed a profound knowledge and understanding of trees and the environment at a young age, and throughout his life he continued to revere nature. For each handcrafted Nakashima chair, table, desk, or cabinet, he carefully considered the qualities of an individual piece of wood and made it useful by adding “human made” elements (legs, chair spindles, etc. ), also crafted of wood. With each piece, Nakashima sought to reflect and reveal the natural rhythms of the tree’s lines and grain. He believed that each piece of furniture he made gave the tree a second life and provided people the opportunity to live with nature, even if they could not live in nature. For Nakashima and his daughter, Mira, there is a deep spirit within each tree, that enhance peoples’ lives. As furniture designers, Nakashimas’ connection to the natural world has been both profound and hands-on. They never simply waited for shipments of wood to arrive at the studio; rather, they’ve ventured out in search of trees, overseeing the milling process themselves and transforming the wood with their skillful, loving hands into beautiful, organic pieces of furniture. When commissioned to make a table, chair, cabinet, or desk, George would do his best to leave the tree in its organic state–focusing on the wood’s growth pattern and its natural beauty without sacrificing practicality. A chair needed to not only to respect the wood and be beautiful; it also had to be comfortable and useful. If the work pleases the artist and pleases others, then the destiny of the wood has been fulfilled. • Studied with architect Antonin Raymond, Frank Lloyd Wright’s collaborator on the Imperial Hotel in Tokyo. Jan Yager did not need to look far to find inspiration for her handcrafted jewelry; however, she did need to look carefully. Yager lives and works in a rough, inner-city environment, where buildings replace trees. Despite this austere urban landscape, Yager has made a conscious decision to work locally, very locally—within one city block. As she began to mine the area for inspiration she came across an empty lot overgrown with weeds. Since then, Yager has been using this field as her design laboratory. She now finds beauty in weeds that she once overlooked. Walking slowly across the overgrown lot, Yager examines the overgrowth. She does not randomly pick the weeds, grasses, and small flowers. Instead, she carefully scrutinizes the visual buffet before making her selections. For Yager, even the smallest, most frequently overlooked natural materials are important and serve a purpose. She respects the landscape and learns from it. The pieces she mines from her “field” often serve as the templates for her jewelry designs. In her hands, these simple weeds, plants, and flowers become beautiful, wearable artworks layered with meaning and purpose. For Yager, these are important stories to tell, as they illustrate the delicate balance between humans and nature. Both Mira Nakashima and Jan Yager use raw materials and draw inspiration from nature to create their handcrafted furniture and jewelry. Natural materials are an essential part of many craft artists’ work. Their work would not be possible without birch bark, sweetgrass, clay, wood, or natural fibers, for example. Like the Nakashimas and Yager, each artist transforms these raw materials by hand into beautiful, functional works of art that reflect their relationship to nature. This deep connection to the natural world is what inspires them, and they fully understand the vital role nature plays in realizing their creative visions. Make one photocopy for each student of the Nature Walk worksheets (Landscape: Natural Connections Worksheet #1). On the day the class meets, gather the students and explain that they are going into the school yard to see what natural elements they can find. Have them use the worksheet to record their findings. After they have completed their worksheets, discuss their discoveries. Note: If your school is located in a urban area or your school landscape appears to offer few natural resources, have students undertake this activity anyway–you and they may be surprised by what they find. Engage students in a conversation about what they discovered on their nature walk. Possible questions include: What did you see that you would not have noticed if you were not looking carefully? Of the things you noticed, what surprised you the most? What things did you notice that you would consider beautiful or unique? Why? What natural elements did not appeal to you? Were you surprised by how many things you found that you did not notice before, even though you’ve spent so much time in these areas? What was the smallest thing you noticed? How did it catch your attention? Have students view the DVD segment on Jan Yager (jewelry/LANDSCAPE) or online at www.craftinamerica.org/shorts/jan-yager-segment. After viewing, engage them in a conversation about Yager and her process. What made her decide to use her neighborhood as a source of inspiration for her work? Why does she limit the area where she looks for materials and inspiration? Are you surprised by how much she has collected from that area in terms of materials and ideas? Why or why not? What does she do with the things she collects? How does nature play a role in her work? What does she make that is directly inspired by nature? Now show students the DVD segment on George Nakashima (wood/LANDSCAPE) or online at www.craftinamerica.org/shorts/george-and-mira-nakashima-segment. Ask them to consider this question while viewing the segment: What is George Nakashima’s relationship to nature? After viewing, engage students in a conversation about the work of George Nakashima and his daughter Mira. What is the Nakashimas’ relationship to nature? How is it different from Jan Yager’s relationship to nature? What inspires the Nakashimas? How do you know that the Nakashimas have a great respect for the materials they are using? What is it they are trying to make with these materials? What roles do beauty and function play in the making of their furniture? How do they highlight the natural beauty of the wood? Why is that important to them? Could you see their designs being made out of some material other than wood? Why or why not? View additional DVD and web segments on featured artists Jan Yager and George and Mira Nakashima. Examine DVD or web segments for other artists and art forms that explore the theme Natural Connections. What role does nature play in their artwork? What is their relationship to nature? Compare and contrast David Gurney (clay/LANDSCAPE), Kit Carson (jewelry/LANDSCAPE) and/or Dona Look (jewelry/COMMUNITY) with Jan Yager and George and Mira Nakashima. In small groups, have students investigate the exhibition on the Craft in America Web site: www.craftinamerica.org. Assign each group one medium to explore (clay, wood, metal, glass, or fiber). Use the Craft in America: Expanding Traditions worksheet (Landscape: Natural Connections Worksheet #2) to guide their investigation. Questions for students to consider include: From this grouping, who are some of the other artists who use nature as inspiration for their artworks? Select one artist. Where does the artist live? Describe the artwork. How does your artist incorporate nature into his/her work? Can you tell by looking at the artwork whether the artist is inspired by the landscape and/or natural environment where they live? When the groups have completed their investigations, have them share what they discovered. Then ask: Are you surprised by the fact that there are so many craft artists who draw on nature or the natural environment for inspiration? Why or why not? Project an image of Jan Yager’s Tiara of Useful Knowledge (2006). Use the artwork to begin a general discussion about tiaras. What is this? Who typically wears a tiara (monarchs, brides, celebrities, young girls, etc.) and why? With what are tiaras and crowns typically associated (royalty, romance, wealth, and high style, etc.)? From what are they usually made (gold and silver metals, gems)? Using Landscape: Natural Connections Worksheet #3, have students focus on Yager’s tiara. As students begin to answer the questions on the worksheet, prompt the discussion with information about Yager, the tiara, and its meaning. When they have completed the worksheet, ask: What makes Yager’s tiara unique or different from others? Do you think she intends for someone to wear it? Why or why not? What surprised you the most about this artwork? Using Precious Metal Clay (PMC), have students make a tiara or other piece of jewelry inspired by items from nature. Students could press natural objects into the clay to make textured jewelry. Before students make their objects, have them spend some time researching various plants and flowers. This will allow them, like Jan Yager, to make informed decisions and ensure that their designs are based on real plant life. They should spend time sketching their ideas before deciding on a final design. PMC is a modeling-type clay that is embedded with microscopic particles of silver and has the feel and working properties of clay. PMC is air-dried and fired in a kiln to turn it into a metal object. It can then be polished or soldered like other silver objects. PMC can be found in most craft or art stores. For more information, visit the Precious Metal Guild’s Web site at www.pmcguild.com. As an alternative to PMC, students can use tooling foil to create a tiara. Use a pencil to incise nature-inspired designs into the foil or create impressions in the foil by laying it on top of a sturdy natural object and rubbing the foil. When working with the foil, have students place a piece of felt or folded newspapers underneath it so it has some “give” when “drawing” on it. Students can cut out their images and shape them into a tiara or some other wearable item. 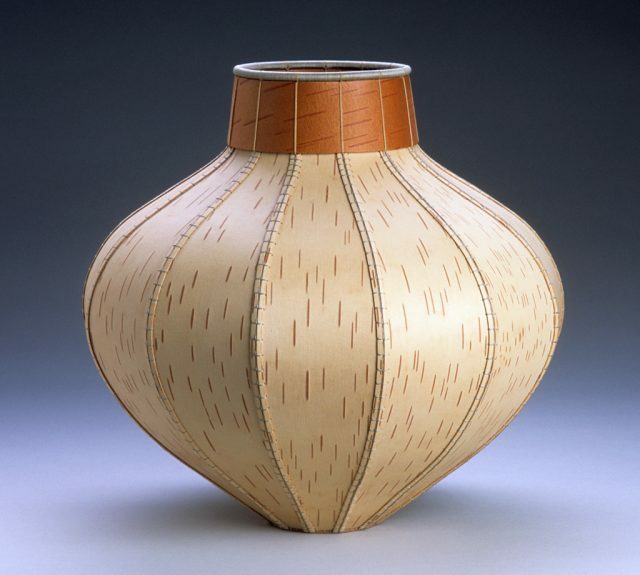 Basketmaker Dona Look, like Jan Yager, is inspired by nature: her birchbark vessels are made entirely of natural materials. Students can make their own stitched vessels out of handmade paper embedded with objects from nature like seeds, grasses, and small leaves. You will need a few deckles (wooden frames attached to a wire screen) and a blender to turn recycled paper into paper pulp. When you have blended some torn-up paper with water to make a slurry, scoop out the material and spread it thinly on the deckle. Then have students embed the natural materials into the wet paper and let it dry. When the paper is dry, students can cut it into shapes for the sides of their vessels and stitch them together with raffia, leather, or another natural string. Weaving is yet another art form that lends itself to working with materials from nature. Students can create simple weavings on cardboard looms or wooden frames and use natural objects like raffia, twigs, long grasses, grapevine, willow branches and/or raw wool to make the weft (the threads that run horizontally on a weaving). These can also be woven with yarn interspersed with natural items to create a simple weaving inspired by and made from natural materials. Write the two quotes below on the chalkboard. Have students, through group discussion, interpret and reflect on the meaning of each. Use their responses and insights to gauge their understanding of the important role nature plays in the world of craft. Some people consider these weeds, the worst weeds in the world, but I think they’re beautiful. Have you ever noticed how many things in our world, our daily life, are made from natural materials? Have students spend five minutes looking around a room in their home to count the things inspired by natural materials–patterns, furniture, design, clothing, baskets, jewelry, wallpaper, etc.